Raw conversion. Crop. Levels and curves in layers. Despeckle. Resize and save as jpg. Wow, this one is sooo....underrated. Thought it would at least be in the top 20. One of my favorites. I don´t mind not knowing excatly what the photo is showing, river and frosty flowers I guess, because it´s pure beauty of form and colors are more than enough. Excellent composition overlooked by far too many. Message edited by author 2006-01-11 18:30:49. Very nice image. I love the blue color cast. Not sure what it is, but I like it. Nice exposure. that is wicked, anyone who can keep my attention for more than 30 seconds gets a 10 from me....sweet! Multiple shapes of water in multiple states, hard and soft visually and physically - love it. This is a beautiful and unique twist on a 'water' shot. 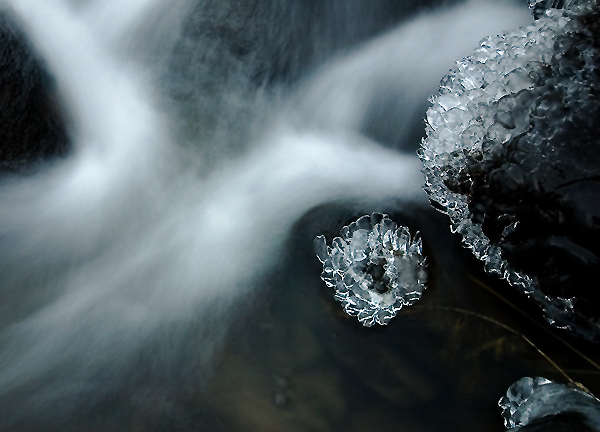 I love the ice formations. Proudly hosted by Sargasso Networks. Current Server Time: 04/19/2019 04:17:07 PM EDT.